Studies show that diverse environments work. A diverse environment not only increases overall business performance, but also provides a space where employee differences, while highlighted, are used to foster innovation and true inclusiveness. Researchers have started to drill down to deeper definitions of diversity–race, gender, sexual orientation, and so forth. They are trying to find better ways for companies to create conditions in which potentially marginalized groups can succeed. A Gallup poll earlier this year found engagement and inclusiveness to be closely linked. According to the poll, employee retention was the highest when managers and employees of different races worked in an engaging workplace, even higher than managers and employees of the same race, in stimulating, collegial work environments. Engagement can go beyond the typical activities to increase employee participation. For instance, AT&T CEO Randall Stephenson recently addressed company employees about the escalating racial tensions in Charlotte, North Carolina; how communities are being affected; and that black lives do, indeed, matter. Stephenson reiterated that, while these topics are uncomfortable, tolerance and inaction are worse. “If this is a dialogue that’s to begin at AT&T, I feel like it probably ought to start with me,â€ he said. BLACK ENTERPRISE and the Executive Leadership Council, the leading organization of black senior managers, will officially unveil and acknowledge theÂ 2016 roster of companiesÂ for their achievements at the ELC’s 30th Anniversary Recognition Gala this evening. These 50 companies recognize the value of the link between diversity and engagement, which is driven by corporate leadership at the highest level. BLACK ENTERPRISE‘s editorial research team, in partnership with the Executive Leadership Council, sent surveys to the nation’s top 1,000 publicly traded companies to get an in-depth look at the ethnic and gender composition of these corporations, as well as understand various programs designed to foster and maintain an inclusive working environment. The annual survey is centered around efforts focused on African Americans, but also includes other ethnic minority groups as defined by the U.S. Census Bureau. Any information provided by companies on diversity efforts targeted toward women, LGBT, the disabled, and veterans were used as secondary, supporting data for inclusion on the list. We measured companies against each other using data from four key categories: employee base, senior management, board of directors, and procurement. Based on a quantitative and editorial analysis, each company received a score. The senior management and board of directors categories were given a higher weighting, based on company impact across the board. Procurement was also a major factor, while employee base was given a lower weighting. We reviewed the status of companies across all BE diversity and corporate leadership lists, including The Top 35 Companies for Supplier Diversity, The 100 Most Powerful Executives, Top Diversity Executives, as well as companies that have chief diversity officers and/or designated diversity departments. We also considered those companies in which the CEO takes an active role in diversity practices. Employee Base: The percentage of African Americans and members of other ethnic minority groups represented in a given company’s workforce. African Americans and members of other ethnic groups. Board of Directors: The percentage of African Americans and other ethnic minorities represented on corporate boards. Procurement: The percentage of total procurement dollars spent with companies owned by African Americans and members of other ethnic minority groups. 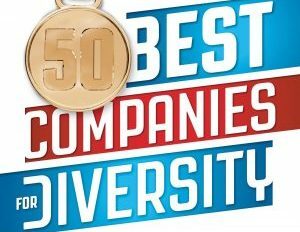 Click here to see The 50 Best Companies for Diversity list.